The combination of expanded and ribbed steel with rolled edges makes this square commercial outdoor table highly functional and aesthetically pleasing. The unique design of the top and seats prevents rust from forming by allowing rain water to filter through. This thermoplastic coated square commercial outdoor table can match any environment. 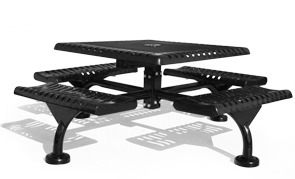 The steel top and seats are finished with a lightly textured Polyethylene coating in any of the color options shown below. Span Style frames can also be powder-coated to match, with optional grout covers as well. 2-7/8" O.D. Span Style Steel Frame.